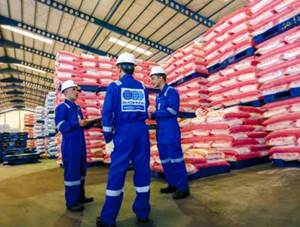 PT Superintending Company of Indonesia (Persero) - PT SUCOFINDO (Persero) or known as "SUCOFINDO" is a well-established state-owned company in Indonesia, running business in inspection and supervision services. Headquartered in Jakarta, SUCOFINDO engaged in inspection and audit services, testing and analysis services, certification services, training and consultation services. As a state-owned company, SUCOFINDO is majority owned by the Government of Indonesia. As of December 2016, SUCOFINDO is 95% owned by the Government of Indonesia and other 5% remaining shares was owned by Societe Generale de Surveillance Holding SA (SGS SA). With services in all parts of Indonesia, SUCOFINDO now has 28 branch offices, 31 service units. SUCOFINDO also supported by 1 SBU Laboratory at Cibitung Bekasi and 1 Laboratory at Surabaya East Java. In term of financial performance, SUCOFINDO managed to record total revenue of Rp 1,861.76 billion in 2016. This was down 7.19% year-on-year (YOY) from the same period previous year. SUCOFINDO registered total revenue in 2015 worth of Rp 2,006 billion, according to information found in PT Superintending Company of Indonesia (Persero) Annual Report 2016 as quoted by JobsCDC.com. Referring to its annual report, SUCOFINDO booked total profits of Rp 148.24 billion in the 2016. This total profit is down 19.22% YOY from Rp 183.65 billion in 2015. Maximum age of 26 years old (when applying). Minimum GPA 3.00 (scale 4.00). Preferably for those who have skill in operating chemical testing laboratory equipment. D3/S1 degree in Electrical Engineering, Mechanical Engineering, Telecommunications Engineering. D3/S1 degree in any field. Have experienced in the field of administration of issuing certificates / reports. D3/S1 degree in Management, Accounting. Maximum age of 27 years old (when applying). Able to work in team work and under a tight work schedule. Preferably for those who have experience in the field of Purchasing. Preferably for those who have experience in the field of Finance. Have experienced in the field of Customer Service. D3 degree in Law, Management, Human Resource Psychology. Have experienced in the field of Human Resource. Certificate of Work Experience (if any). JobsCDC.com now available on android device. Download now on Google Play here. Please be aware of recruitment fraud. The entire stage of this selection process is free of charge. PT SUCOFINDO (Persero) - D3, S1 Officer, Technician, Analyst SUCOFINDO February 2019 will never ask for fees or upfront payments for any purposes during the recruitment process such as transportation and accommodation.